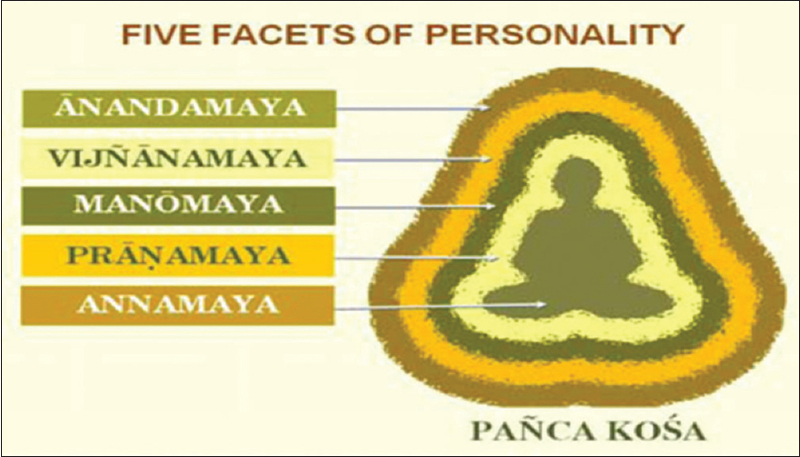 One such model from Vedic literature is the concept of five sheaths model of human existence or traditionally known as pancha kosha model [Figure 1]. According to this, our human existence is not only restricted to the physical body, the annamaya kosha, but also other subtle layers such as pranamaya kosha (bioplasmic sheath), monomaya kosha (emotional sheath), vijnanamaya kosha (wisdom sheath), and anandamaya kosha (bliss sheath). Srinivasan T. Models and mechanisms in yoga research. Int J Yoga 2012;5:83-4. Nagarathna R, Nagendra HR. Integrated Approach of Yoga Therapy for Positive Health. Bangalore: Swami Vivekananda Yoga Prakashana; 2008. Gambhirananda S. Taittiriya Upanisad. Kolkata: Advaita Ashrama; 1979. Jnanananda B. The Essence of Yogavāsistha. 1st ed. Pondicherry: Samata Books; 1982. p. 263.